As part of our mission to help you make smarter decisions, we’ve developed signals for you to know how you’re doing when it comes to billing. The Invoice Quality Score helps you create invoices that look professional, communicate accurately, and ensure customer satisfaction and timely payments. Customers are 15.8% more likely to repurchase from businesses that include a logo on their invoice. Customers are 4.5% more likely to recommend your service when you thank them for doing business with you. ZipBookers receive payment 14.6 days earlier when credit cards are accepted. 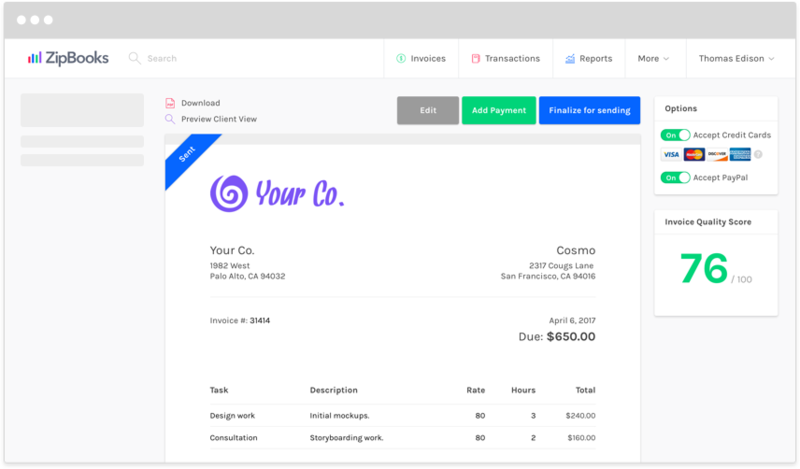 The Invoice Quality Score constantly looks for ways to make your invoices smarter to help your business grow. The more you use ZipBooks, the more we can recommend what works for you. A string of small steps can have an outsized impact on your profitability and overall business results. Combine the Invoice Quality Score with tips in the recommendation box and you can apply ZipBooks' science to your business growth.